Here you find our main cooperation partners and the members directory. Telemedicine utilizes modern telecommunication technology to provide medical services at a distance by connecting two or several medical centers and enabling exchange of expert medical information. Telemedicine has therefore a potential to offer developing countries qualitative and quantitative improvements in medical care. The inherent visual nature of dermatology makes Teledermatology easily applicable to virtual medicine. African Teledermatology has been created to provide dermatology support to local physicians, dermatologists, and health care workers in hospitals and clinics throughout Africa. This support is provided through Teledermatology consultation services, discussion pertaining to diagnosis and management of patients with skin diseases, links to educational resources, and access to a dermatologic curriculum created specifically for African sites. African developing countries have only a very limited number of qualified dermatologists. Teledermatology has therefore the potential to offer a prompt channel for long distance consultation and consequently provide means for improving medical care of skin diseases. The purpose of this project is to establish a virtual collaboration between African partners, USA and Austria. A unique online archive of tropical skin conditions will also emerge which should serve as an internet source of educational material for training and updating of medical specialists and health personnel. A secondary aim of the project is to establish and secure an active channel and platform for dermatological research collaboration. The scope of this project is the integration of the various aspects of Teledermatology and Tele-dermatopathology, using a best practice model, creating an innovation- and investment-friendly surrounding for the broad-scaled implementation of telemedical applications in Africa. This project has been funded by the Commission for Development Studies, Austrian Academy of Sciences (KEF: Kommission für Entwicklungsfragen, Österreichischen Akademie der Wissenschaften). 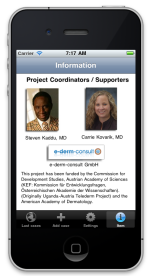 (Originally Uganda-Austria Telederm Project) and the American Academy of Dermatology. NEW REFERENCE BOOK ON DERMATOLOGICAL THERAPY! Dermatological Preparations for the Tropics. A formulary of dermatological preparations and background information on therapeutic choices, production and dispensing. Please log in and find the book and other information at 'Curricula'! At www.telederm.org users are invited to submit clinical and dermatopathologic cases of interest to the discussion forum thus making them available for viewing and comment by all other members. dermoscopy.telederm.org is a forum open to all members where they can discuss issues related to dermoscopy and skin tumors.